Getting a Notice From the IRS – What to Do! What to do When You Receive a Notice From the IRS? 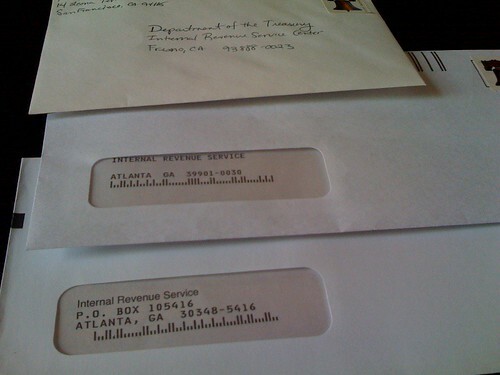 You go to the mailbox, pull out your mail, and Holy Craaaaaap there is a letter from the IRS … and it ain’t no check! You reluctantly open it and find it is a notice that you owe money. You are pretty sure you filled out the forms properly and legally, but is it possible that you forgot to claim something that they found out about? What will they do to you if they think you intentionally cheated? OMG!!!! What now? Going to jail or just spending the rest of your life running. First things first! Run to the house and change your under-ware before the neighbors see the brown spot! It’s not necessarily the end of the world. The IRS literally sends out millions of these notices, most for clarification of a minor issue that was either entered incorrectly, or inadvertently omitted from your return. They aren’t after you. They are after your money … the money you owe and nothing more! On the other hand, you can’t get away with just ignoring the notice. There are some very important steps you need to take when you receive such a notice. It may sound ridiculous that some people don’t automatically read the notice but many folks are too terrified to even open the letter. Don’t panic! You’ve got to read what they’re telling you. Quite often all they’re asking for is clarification on your return, something didn’t match up in their records. It could be quite simple! Don’t ignore it. The IRS has these wonderful computer systems in place that keep track of your situation, even when you’re not. Ignoring the situation will not make it go away. So start with the letter, and figure out what you need to do to straighten things up. Sometimes it may not be much. Sometimes it is just a notice to inform you of the situation and doesn’t take any. I, for one, received a notice that simply stated I had made a mistake and they had corrected it. On your notice there should be a number to call if you don’t understand the notice, or if you have questions. Bear in mind that this first line of defense at the Service is mostly interested in collecting money – and if that’s what your notice is about, you need to be prepared to hold your ground if you disagree with the notice. Every notice you receive, every time you call, every time you write, keep a record of the interaction. When you talk to the IRS office, every person you speak with will give you his or her name and badge number. Write it down – along with everything you say, and everything the IRS agent says. This can be critical if something changes along the line, and you need to justify why you did one thing or another. If you’re overwhelmed by the notice, the communication, and the whole process, get help. You can find experienced tax professionals in your area by looking on the National Association of Enrolled Agents (NAEA) website. These folks are ready and willing to help you through the difficulties of working with the IRS – even if you’ve already started the communications process and found out you’ve bitten off more than you can chew. If the notice indicates that you owe the IRS some amount of money, don’t just pay it to get it over with. The IRS is often wrong – especially when it comes to missing tax forms or miscalculations. It may seem like the safest thing to do: give them whatever they’re asking for and get them off your back! But it can really work against you if you don’t know what you’re doing. For example, if you had cashed in a bond and forgot to include that information on your return, the IRS is going to assume that you had a zero basis in the bonds. If you purchased the bond for $15,000 and later sold it for $15,200, the IRS only knows about the $15,200 that you received when you sold the bond, and in their notice they’ll indicate that you owe tax on $15,200. But in the end, when you file your amended return with your basis properly reported on Schedule D, you end up only owing tax on the $200 gain. Huge difference! And, if you just gave in, you’d have given them far more than you really owed. If it turns out that you do actually owe additional money to the IRS and you just can’t swing paying it all at once, ask for a payment plan. It’s not cheap to do this, but it’s a whole lot better than just ignoring the IRS altogether. Not paying the amount you owe could cost you plenty more in interest and penalties when they finally do catch up with you. While not likely, it could land you in jail! Okay! So you got the notice. It’s probably not the end of the world, but it probably will require some action on your part. Don’t ignore it! Read it! Take action! Do something about it … and get help if you need it! Good Luck!!! I’m from the IRS and I am here to help you! and, I promise I won’t …………. never mind #3! Papa B.